Sadly/happily, I have now left the misty Blue Mountains and moved to the open plains of Castlemaine in central Victoria. There are a couple of grottoes I failed to photograph while living in the Blue Mountains, namely the dilapidated one that exists on a track down a hill behind the Katoomba Falls Kiosk near Scenic World in Katoomba. When I did my talk on grottoes in 2015 at Pecha Kucha (grotto talk), a young boy told me about it, and how he has turned into his own private cubby house. There's also another grotto in the lower mountains on a walking track that I lost the directions to that someone else told me about - bad bad researcher! Colonial Australian landscape design adopted the English Landscaping School of the 1800s. The ‘Picturesque Movement’ eradicated geometric designs and embraced designs that replicated nature. This familiar design served English settlers well as the recognisable English foliage mitigated homesickness. Building a grotto on one’s property was often part of this plan and so the grotesque also made its way into Australian landscape design. The Blue Mountains in New South Wales hosts a number of artificial grottoes (known locally as picnic huts) sitting silently in town parks and deteriorating slowly from concrete cancer. Here, they are not found in private gardens but exist in public parks. The history of these grottoes dates back to the post-WWII period when teams of returned servicemen were put to work to create picnic huts and shelters particularly in the upper Blue Mountains towns of Katoomba and Leura. The creation of the grottoes, which were made from cement-rendered steel, was most likely led by Tom Adams. 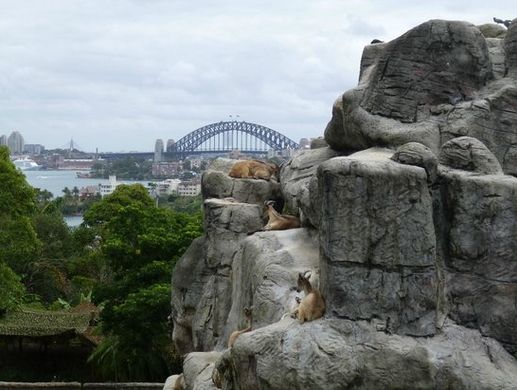 Adams was a landscape designer who also built similar structures at Taronga Park Zoo, notably Monkey Hill that now houses mountain goats [see figure above]. There is scant information on Tom Adams and his projects in the Blue Mountains. The Blue Mountains City Council and local historians are aware of his importance to local history yet little documentation exists on record.